There are all sorts of rules and regulations about the proper display of the American flag– when it can be displayed, where it can be displayed, and how it should be regarded. For example, apparently it’s a violation of the Flag Code to display the flag horizontally on a football field, as is a common practice in games across the country. Whoops! But what about the White House? There’s a legend out there that the US flag is only flown over the White House when the President is in the District. If he’s not in DC, no flag is flown. With all the specifications and regulations in the Flag Code, I wouldn’t be surprised if this one was true– but is it? Nope. 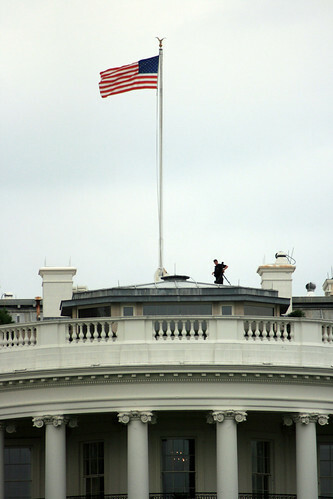 Lonnie Hovey, the Director of Preservation of the Eisenhower Executive Office Building under President Bush, says that the White House flag is flown 24 hours a day. This urban legend may have grown because in the UK the Royal Standard is only flown when the Queen is in residence. Not so in the US– Old Glory is always there. 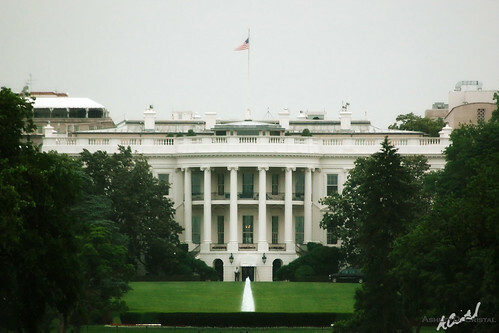 In fact, the 24-hour flying of the flag at the White House is mandated by law. 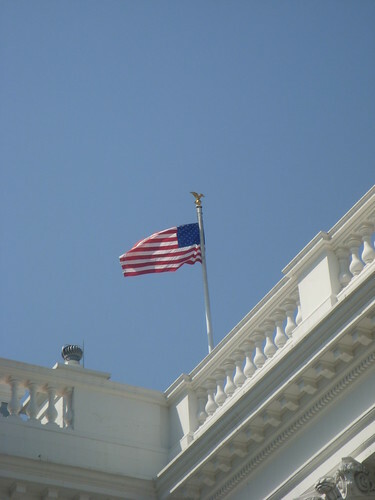 Only a select few locations are authorized by executive order to fly the flag around the clock: Fort McHenry and Flag House Square in Baltimore, the Green of the Town of Lexington MA, US Customs Ports of Entry, the National Memorial Arch in Valley Forge PA, and three locations in the DC area– the White House, the 50 flags around the Washington Monument, and Iwo Jima. There are also plenty of other urban legends about the display of the flag at the White House. Contrary to what some right-wingers think, Obama did not authorize the Chinese flag to fly over the White House last fall. Only the US flag flies over the White House, though foreign flags are displayed on the White House grounds only during state visits. Other flag facts: the President and the governors of states are the only ones allowed to order flags flown at half-staff, though flags are to be flown at half staff automatically in certain cases (30 days for the death of a president, 10 days for the death of a vice-president, 2 days for the death of a member of Congress). So in conclusion, the flag is always flying above the White House, regardless of whether the President and the other Obama family members are home. It’s probably a bigger myth to people outside of DC, since some of us see the flag above the White House every day on our way to work, but it’s another piece of trivia to add to the tours of the city you’ll be giving to friends and family in town this week for cherry blossoms. I believe that the rules also state that if you are flying a flag 24 hours a day, it has to be lighted at night. Great article, thanks! Cool article; I’d never heard of this one. There are also the flags on the moon which are flown 24 hours a day…well, the ones that are still standing and didn’t get knocked over when the Lander’s rocket fired (I’m looking at you Armstrong and Aldrin!). Another source of the myth might be Congress. Isn’t a flag flown over the House or Senate wings only when that chamber is in session? When it gets really windy they do take down the flags around the Washington Monument. Not sure what the wind speed threshold is, but it’s already happened a couple of times this year. I don’t know if there’s a similar regulation for the White House flag. Yes, the issue of the flag being illuminated is a matter of protocol. It is becoming an issue as the government, federal and otherwise, become more ‘green’ and implement sustainable building standards. Sustainable building guidelines state that night light should not leave the site, including upward-aimed lights that would illuminate the flag. That means the flag must be taken down every night and in many locations that would mean an official ceremony every single night and morning to lower and raise the flag. I thought I had heard that the flag on top was Nixon’s doing, and that’s one way to notice inaccuracies in movies set before 1970, before the flagpole went up. Where are the 3 American flags that are never lowered? The White House flag is never lowered? I’ve seen it flying at half mast several times. Brian @2 – yes, the flags above the House/Senate floors are only flown when that particular chamber is in session.